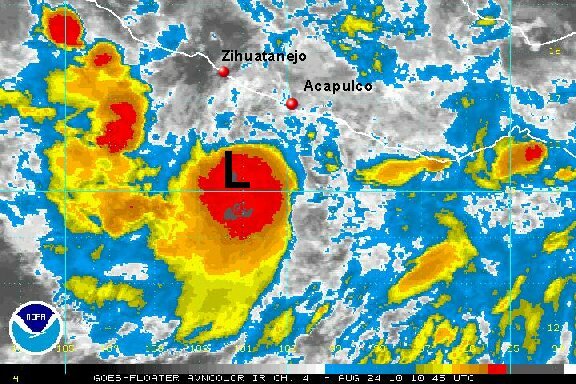 Deep convection has gained enough organization generally south of the Gulf of Tehuantepec to be classified as the next tropical depression. 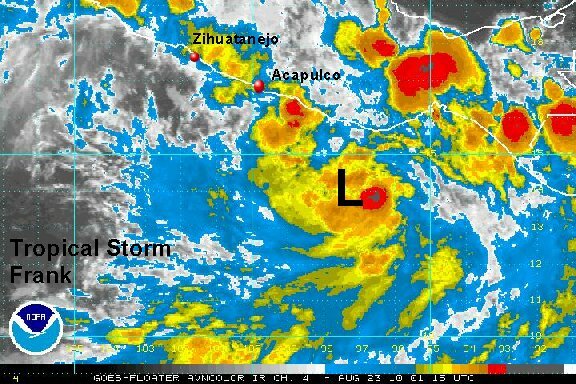 As of 8:00 pm edt / 5:00 pm pdt tropical depression 9E was centered near 13.7°N / 93.5 °W or roughly about 205 miles southeast of Salina cruz, Mexico. Movement is to the west southwest at about 2 mph. Top sustatined winds are estimated at 35 mph. Forecast models take the tropical low generally west, then a few days out turns more northwest and parallels the coast of Mexico. 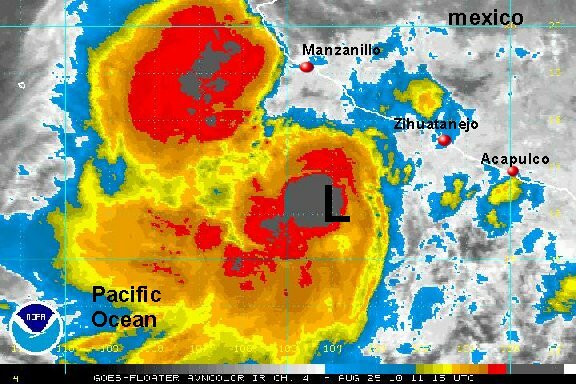 Interests along the west coast of mexico should follow the progress of this tropical cyclone. 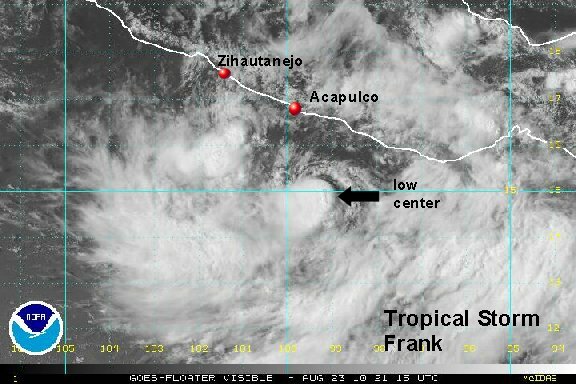 It looks like tropical storm Frank has formed south of the Gulf of Tehuantepec. Deep convection is growing and spin is noted. visible satellite will help with the exact low center which will also help in estimating strength. A recent satellite estimate was at 41 knots which looks reasonable. 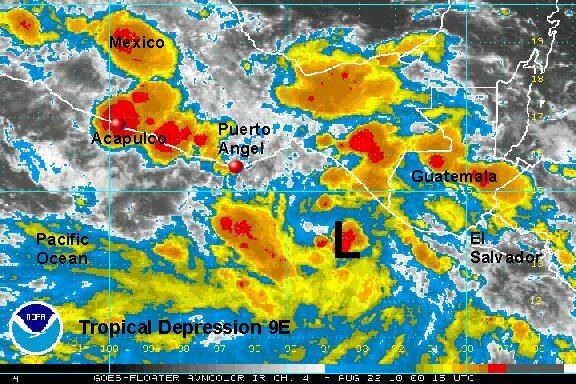 As of 8:00 am edt / 5:00 am pdt tropical depression 9E was centered near 13.5°N / 94.9 °W or roughly about 300 miles southeast of Puerto Angel, Mexico. Movement is to the west at about 7 mph. Top sustatined winds are estimated at 40 mph (NHC 35 mph). Pressure estimated at 1005 mb. Tropical depression 6 has organzied into tropical storm Frank with deep convection expanding. Most of the effects remain offshore, with only rain bands near Puerto Angel, Mexico. As of 3:00 pm edt / 12:00 pm pdt tropical storrom Frank was centered near 13.8°N / 95.8 °W or roughly about 135 miles south southeast of Puerto Angel, Mexico. Movement is to the west at about 7 mph. Top sustatined winds are estimated at 50 mph (NHC 50 mph). Pressure estimated at 1002 mb. Frank changed little overall last night. The convection is not quite as impressive, so we held our wind estimate at 50 mph. the hurricane center is at 60 mph. Rain bands are along the coast with the worst weather remaining offshore. As of 7:00 am edt / 4:00 am pdt tropical storm Frank was centered near 14.3°N / 97.6 °W or roughly about 110 miles south southwest of Puerto Escondido, Mexico. Movement is to the west at about 7 mph. Top sustatined winds are estimated at 50 mph (NHC 60 mph). Pressure estimated at 998 mb. Forecast models take Frank generally wnw and parallel to the coast of Mexico before moving farther offshore in a few days. Interests along the west coast of mexico should follow the progress of this tropical cyclone. 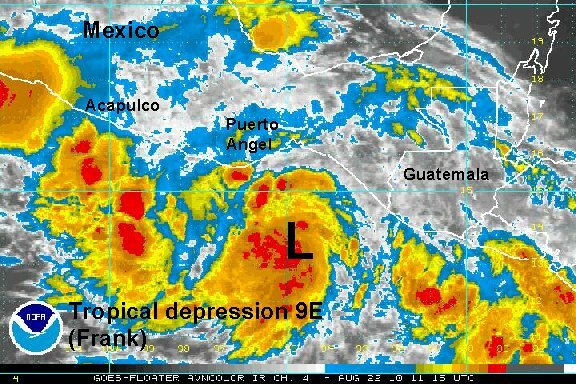 Frank remains small and weak with essentially no effects to the coast of Mexico. The east side of the circulation is fighting wind shear. As of 6:00 pm edt / 3:00 pm pdt tropical storm Frank was centered near 14.9°N / 99.4 °W or roughly about 150 miles south southeast Acapulco, Mexico. Movement is to the west northwest at about 9 mph. Top sustatined winds are estimated at 45 mph (NHC 50 mph). Pressure estimated at 1000 mb. The low level center is still not under the middle of the convection indicating some shear. Deep convection has increased some though, so Frank is probably a little stronger than last night. Most of the effects from Frank remain offshore except for some rain bands near the coast. As of 8:00 am edt / 5:00 am pdt tropical storm Frank was centered near 15.3°N / 101.2 °W or roughly about 140 miles south southwest of Acapulco, Mexico. Movement is to the west northwest at about 9 mph. Top sustatined winds are estimated at 50 mph (NHC 50 mph). Pressure estimated at 1000 mb by NHC. Forecast models take Frank generally wnw and parallel to the coast of Mexico before moving farther offshore in a few days south of Cabo San Lucas later this week. Interests along the west coast of mexico should follow the progress of this tropical cyclone. 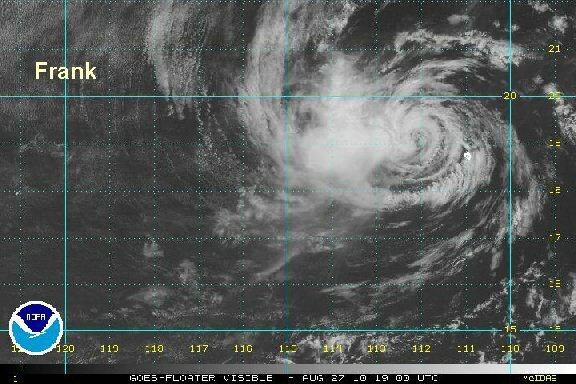 Convection is slowly organizing to the point of Frank becoming a hurricane. Nearly all of the effects remain offshore. Swell will be higher on the west central Mexican coast. As of 9:00 pm edt / 6:00 pm pdt tropical storm Frank was centered near 15.8° N / 103.0° W or roughly about 160 miles south southwest of Zihuatanejo, Mexico. Movement is to the west northwest at about 8 mph. Top sustatined winds are estimated at 70 mph (NHC 70 mph). Pressure estimated at 991 mb by NHC. Frank is currently seeing bursts of deep convectin near and away from the circulation center. If this continues, Frank will be classified as a hurricane later today - probably later this morning. Thankfully, the worst of the effects still remain offshore. As of 8:00 am edt / 5:00 am pdt tropical storm Frank was centered near 16.3° N / 104.0° W or roughly about 195 miles south of Manzanillo, Mexico. Movement is to the west northwest at about 10 mph. Top sustatined winds are estimated at 70 mph (NHC 70 mph). Pressure estimated at 991 mb by NHC. Forecast models take Frank generally wnw and parallel to the coast of Mexico for another day before moving farther offshore. 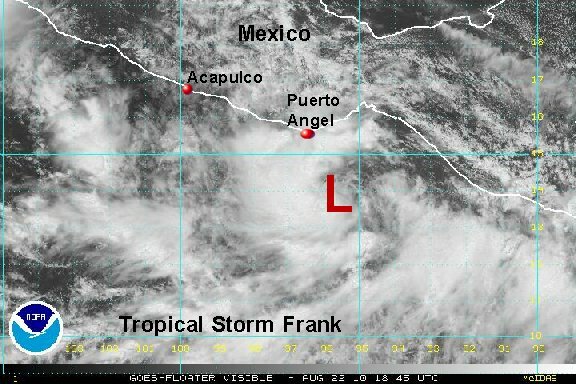 Frank will continue to the northwest, keeping it southwest of Cabo San Lucas. 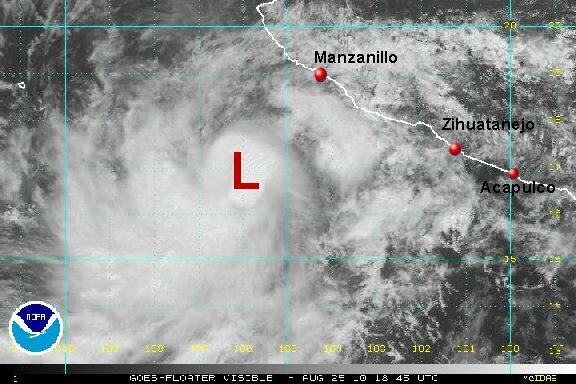 Interests along the west coast of mexico should follow the progress of this tropical cyclone. After a few impressive convective bursts, Frank's convection has waned. It probably is still just under hurricane strength. Most of the effects associated with Frank remain well offshore. We will be going to one a day updates at this point, unless the efffects threaten land significantly. As of 3:00 pm edt / 12:00 pm pdt tropical storm Frank was centered near 16.8° N / 106.2° W or roughly about 190 miles southwest of Manzanillo, Mexico. Movement is to the west northwest at about 10 mph. Top sustatined winds are estimated at 70 mph (NHC 75 mph). Pressure estimated at 987 mb by NHC. Frank has weakened considerably today. The low level center is badly exposed with only a little deep convection to the west of the low. NHC will drop winds down at the 2 pm pdt advisory. This will be or last update on Frank. 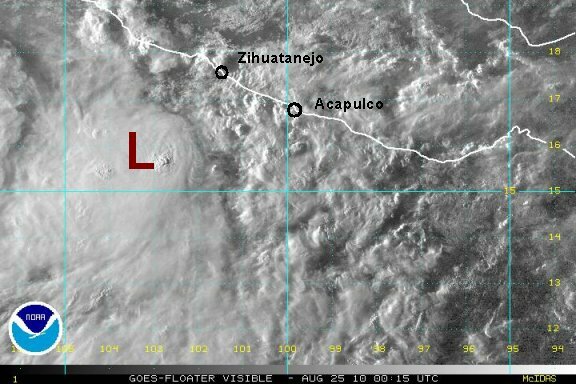 As of 4:00 pm edt / 1:00 pm pdt Frank was centered near 19.2° N / 112.2° W or roughly about 290 miles south southwest of Cabo San Lucas, Mexico. Movement is to the west northwest at about 6 mph. Top sustatined winds are estimated at 45 mph (NHC 75 mph 8 am pdt advisory). Pressure estimated at 987 mb by NHC. Forecasts take Frank more north then eventually northeast as it weakens west of the southern Baja over the next few days. Interests on the Baja should follow the progress of this tropical cyclone.